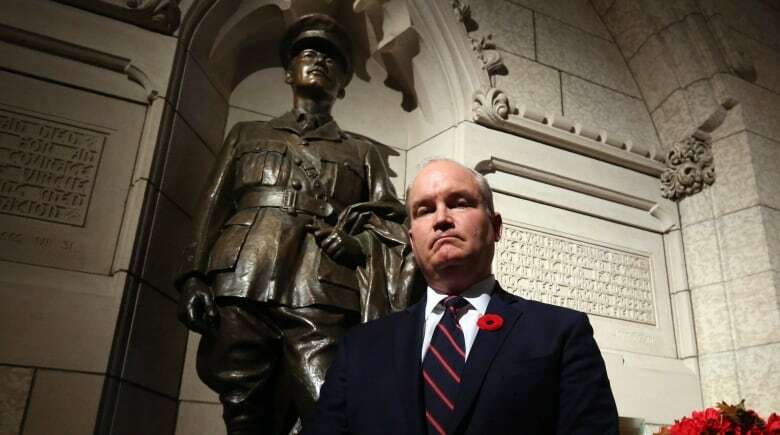 Two of the three companies that competed for a federal contract to deliver job placement services for Canada’s veterans were disqualified for “not having sufficient experience” — even though one of them was doing the work already for Veterans Affairs, CBC News has learned. The $10.4 million contract ended up going to an Oshawa, Ont.-based company, Agilec, which in its previous iteration had done a lot of work for the Ontario government under then-premier Dalton McGuinty. CBC News has obtained a series of documents through access to information legislation and conducted a number of background interviews with current and former government officials to answer questions about how the tender went to a relatively unknown company with no national profile and no offices outside of Ontario. For over a year, officials at Agilec have refused repeated interview requests and directed all inquiries from CBC News to the Department of Veterans Affairs. Conservative MP and ex-veterans minister Erin O’Toole said he’s had his own trouble getting information from and arranging a meeting with officials from the company, which is based in a riding adjacent to his own. He said there has been something “puzzling” about the contract since the beginning and asks whether there was political interference in the contract process. When the contract was awarded, O’Toole said he’d never heard of Agilec, even though he’s well-connected with the Durham Region business community. When he couldn’t get information about the company, he said, he showed up unannounced on their doorstep several weeks ago. Part of the reason O’Toole and others in the veterans community had never heard of Agilec is that, up until four years ago, the employment firm was operating regionally as Northern Lights Vocational Services or Northern Lights Canada. It was rebranded weeks after the 2015 federal election and held a series of contracts with the Ontario government. Provincial public accounts records show the company received at least $14.3 million in two separate contracts from two different departments in its last year operating as Northern Lights Canada. The veterans department gave Agilec two thumbs up, saying it has dealt with a higher than expected number of veterans seeking job placement. “Agilec was, and continues to be, prepared to provide services to these clients,” Alex Wellstead, a spokesman for Veterans Minister Lawrence MacAulay, said in an email. As of mid-January, more than 300 veterans had gone through the system out of the 1,250 that have been approved. What was not addressed in the government’s email response was the question about the sort of qualifications and experience the company had in the first place. The two companies that lost the federal bid were the non-profit charity Canada Company and Maxsys Staffing and Consulting, which is headquartered in Montreal. Unlike Agilec, both losing bidders operate national networks of offices. Sources with knowledge of the file, who were granted anonymity because of the sensitive nature of the procurement process, said the federal government didn’t examine the costing proposals from either Canada Company or Maxsys before rejecting their bids. Canada Company had been working for Veterans Affairs over several years, helping to match retiring soldiers, sailors and aircrew with jobs in the private sector. The federal government appeared to be solidly behind the charity and invested $1.1 million in the group’s online MetPathfinder system one year before the contract went to Agilec. That investment was lost when MetPathfinder was shut down in April last year. Maxsys has been around since 1993. It has a long track record of providing permanent and temporary employees to the public and private sectors. It also delivers consulting services. At first, Public Services and Procurement Canada would not comment on the tender evaluations, but after repeated questions, a department spokesman confirmed the bids were rejected and suggested there were good reasons. “Both of the unsuccessful companies failed to demonstrate that they met all requirements of the solicitation,” Pierre-Alain Bujold said in a recent, written response to CBC News. Bujold did not name either of the companies or provide more specifics. By the standards of federal procurement, this bidding process proceeded at lightning speed. The tender was issued in September 2017 and a winner was declared three months later, in December of the same year. But the federal government did not publicly announce which company had won until February of 2018, two months after the competition closed. The tender stated that the winning bidder must have employment counsellors experienced in working with military veterans. Officials with Agilec refused to answer questions about the qualifications of their staff, but the company’s online recruiting ad says counsellors should have only a “minimum 12 months experience” in the field and a bachelor’s degree. O’Toole said that’s troubling because dealing with veterans is a specialized skill. Many studies have shown that a smooth transition from uniform to civilian life is necessary to prevent some of the most vexing social problems in the veterans community, including suicide and homelessness.